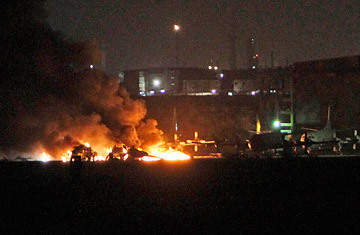 There was more bad news on Sunday for a Pakistani military already reeling from the fallout of the U.S. raid that killed Osama bin Laden: suspected Islamist militants launched a brazen large-scale attack on a Pakistani naval base in the southern port city of Karachi. As many as 15 fighters carrying guns, grenades and rocket-propelled grenades stormed into the Pakistan naval station Mehran on Sunday in the most dramatic attack in years on a Pakistani military facility. The attackers used their rockets to destroy at least two Lockheed P-3C Orion aircraft, used for maritime patrolling, and a helicopter. The aircraft, estimated to be worth $36 million each, had been given to the Pakistan navy by the U.S. Scores of Pakistani commandos were dispatched to the scene and were still battling the attackers at time of writing. The Pakistan navy has confirmed that four of its personnel, including one officer, have been slain. Karachi, a city of 18 million people, was plunged into despair yesterday as thick, black plumes of smoke filled the air along with the sounds of dozens of ambulances racing to the naval base. While no group has yet claimed responsibility for the attack, the prime suspects are the Pakistani Taliban and other al-Qaeda-affiliated terrorist groups. Since the slaying of bin Laden, militants have escalated their terrorism campaign with deadly attacks on the Pakistani paramilitaries on May 13, killing over 90 recruits. Nine days later, they bombed a U.S. consular convoy in the northwest city of Peshawar, killing a bystander. Days after bin Laden's death, the Pakistani Taliban had vowed to exact revenge. The attack has raised familiar questions about how its perpetrators were able to breach the security of such a sensitive installation from three different points of entry. Once inside the base, the attackers rushed into a hangar and began to destroy the aircraft. The Mehran naval base is also the headquarters of the Pakistan navy's air wing. The attackers split into smaller groups of three, and spread themselves across the facility  a tactic used in previous attacks on other security installations, and even in the March 2009 attack on the visiting Sri Lankan cricket team in Lahore. Sunday's attackers set off explosions and fired rockets as they engaged in firefights with navy personnel, before reinforcements from a special commando unit and other paramilitaries arrived. Two of the attackers are reportedly in custody right now. The operation to restore security at the base was still under way seven hours after the attack began, with intermittent exchanges of fire heard at some distance from the naval base. Flames from at least three fires set by the attackers burned brightly, and at least six explosions were heard from outside the base. After cordoning off the area, firefighting teams and ambulances arrived to tame the flames and rescue the wounded. A nearby navy hospital issued an appeal for blood, as Karachi's terrorism-hardened citizens rushed there to volunteer their own. "Terrorists have attacked Karachi again," laments Ayesha Tammy Haq, a columnist and native of the city. "Citizens have come out to donate blood and help in any way they can. Any loss is everyone's loss." Karachi is routinely scarred by target killings between rival ethnic, political and sectarian factions. The attack leaves Pakistan's powerful military facing difficult questions. Analysts believe that the success of an apparently well-organized attack on this scale would have required at least some complicity from within the military. A former navy official told ARY News that the assault appeared to have been planned from a map of the facility. The perpetrators of previous attacks, like the October 2009 siege of the army's general headquarters, were found to have links to low-ranking military personnel with fundamentalist sympathies. Sunday's attack was seen as part of a backlash against the May 2 U.S. raid on bin Laden's compound in Abbottabad, with fears rising that militants are planning a new campaign of high-profile attacks. For most of the past year, the worst terrorist attacks have targeted Pakistan's Sufi-leaning Barelvi population and other religious minorities. The change of focus was attributed to the fact that the Pakistan military had backed off from mounting large-scale counterinsurgency operations. Now, after bin Laden's death, his supporters in Pakistan appear keen to shift back to the security targets they favored throughout 2009. The Pakistan navy appears to have become a particular focus for the militants: in the last week of April, three buses carrying navy personnel were bombed in Karachi. The bulk of the militants' attacks over the years have targeted police, army, paramilitaries and intelligence services; the reasons for targeting the navy in particular are not clear. But the latest attack appears to have been long planned, given its sophistication, even if the cue for its execution was the militants' avowed campaign to avenge bin Laden's death. Since the operation that killed bin Laden, the military has been the subject of rare and fierce criticism, with a broad range of voices asking why they not only failed to locate bin Laden themselves, but also failed to detect the incursion of the U.S. Navy SEAL team. The naval-base attack will serve as a further embarrassment to heavily decorated officers who have long prided themselves on being the guardians of Pakistan's security. But Sunday's carnage could also help Pakistan return to focusing on the extremist enemy within. Recent public discussion has been dominated with complaints about the violation of sovereignty during the bin Laden raid  with Pakistan's Parliament last week uniting to condemn CIA drone strikes against suspected militants on Pakistani soil  reflecting a growing hostility among the public, and even the security forces, over cooperation with the West. When the dust settles on Sunday's attack in Karachi, Pakistanis will have an opportunity to focus once again on those who represent the most immediate danger to their security. See photos of bin Laden's Pakistan hideaway. Watch bin Laden's eerie home videos.